Apparently, the knee injury Rashad Evans suffered Wednesday that forced him to withdraw from this month’s UFC 170 scrap against Daniel Cormier isn’t too serious. On Thursday morning, UFC Co-owner Lorenzo Fertitta told the LA Times the light heavyweight affair has been rebooked for UFC 172. The event takes place April 26 inside Baltimore Arena in Maryland. That wasn’t the only 205-pound switcheroo the UFC made today. 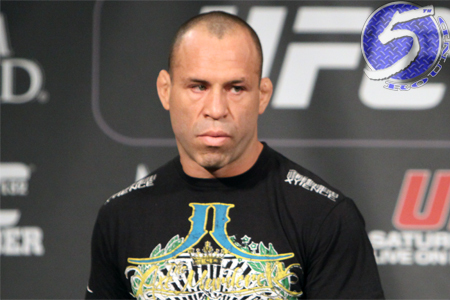 Wanderlei Silva (pictured) and Chael Sonnen, who are currently serving as opposing coaches on “The Ultimate Fighter: Brazil,” were removed from UFC 173‘s co-main attraction slot and given top billing on a May 31 card in Brazil. No word on which Brazilian venue will host the hotly-anticipated shootout. Fox Sports 1 is expected to air the main card live in America. Evans and Cormier now join a card headlined by reigning UFC light heavyweight king Jon Jones, who Cormier has been calling out all the livelong day. The fight week media junkets should be interesting, if not awkward. Cormier will surely request a tango with Jones in his post-fight speech if he’s victorious. In addition, the UFC hedged their bet by placing Evans vs. Cormier on the card just in case Jones or opponent Glover Teixeira fall to injury. Wandy gets his wish and meets Sonnen in his homeland of Brazil, where Chael P. will be heavily booed. Needless to say, Sonnen will be in need of some heavy security for fight week. Here is UFC 172’s revised lineup.